Easter holidays are about to begin. Classes come to an end for a few days, timetables change and you have a lot of free time to play and have fun with your friends and family. But with so much free time, you can find yourself not knowing what to do between plans. But don’t worry as we have thought of some fun and didactic games so that you don’t say that typical “I’m bored! !” sentence at any stage. For that reason, in boboli, we have put our minds to work endlessly to offer you an activity that you will enjoy. We tried again and again to look for the best remedies as you should have fun, learn and discover new things! 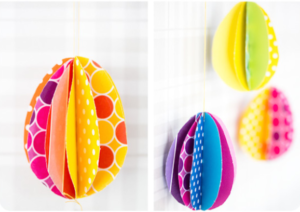 We have thought of a craft that goes hand in hand with this season: Easter Eggs! In some countries, it is very common to decorate the shells of this very ordinary food found in all of our homes. So, we give you a challenge. Do you dare to put the ideas we give you below into practice? Do you know what the advantage of this DIY craft is? That there is no rule, you are the boss! We only show you some ideas so that you and your imagination can use your creativity and create true works of art. You can use so many things that you can find at home like: markers, paint, cardboard, foamy, stickers, ribbons, glitter, string… In only a few minutes you turn a simple egg into a unique piece of art to decorate your living room or even to gift to someone special. You see, it is a great option to spend some fun time with your parents, siblings, friends… You only have to suggest it and be the most creative you can be! Once you try it, you won’t want to leave your house, for sure! A quick tip: don’t get nervous, relax and do everything step by step. The results will amaze you! Dare to make shapes with potatoes! We all have this tuber which we love so much, at home. 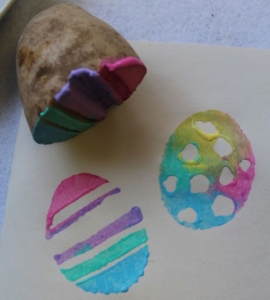 Ask your parents to carve the designs into the potato so you can have fun stamping. With your parents’ help, boil the potatoes and let them cool down. Cut them in half and ask your parents to cut the designs you love into them with a knife. When they are ready, paint them with all the colours you love and stamp them onto the cardboard. Guaranteed fun! 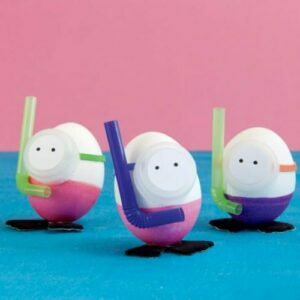 Another great option is to create the scuba diver eggs. You only need to dress them with swimsuits, some goggles and a tube and they will be ready to swim. They will look so funny! Boil the eggs until they are hard. Paint the bottom half of the egg to make the swimsuits. Cut the straws and bend them to make the breathing tubes. Cut the black felt into fin-like shapes. Put a plastic band around the egg and glue the straw, the bottle lid and the fins onto the egg. Don’t glue your fingers together! And finally, draw two dots on the bottle lid to make the eyes. 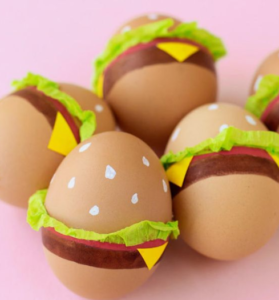 Turn some simple eggs into delicious fake burgers. You’ll probably confuse them for real ones! First of all, boil the eggs and let them cool down. When cool, grab a paint brush and paint white dots to create sesame seeds on a burger bun. Then, paint a red line around the egg, to paint the tomatoes, and below that line, paint a thicker line in brown which will be the burger. When the paint is dry, glue the crepe paper above the red line, to make the fake lettuce. Lastly, cut the yellow papers into small triangles and glue it above the brown line. Glue four tringles on each egg, proportionally spread. Eggs made with printed cardboard cut outs. A great option to hang up and decorate your room. Draw the shape of an egg onto the cardboard using a template. Draw four eggs. 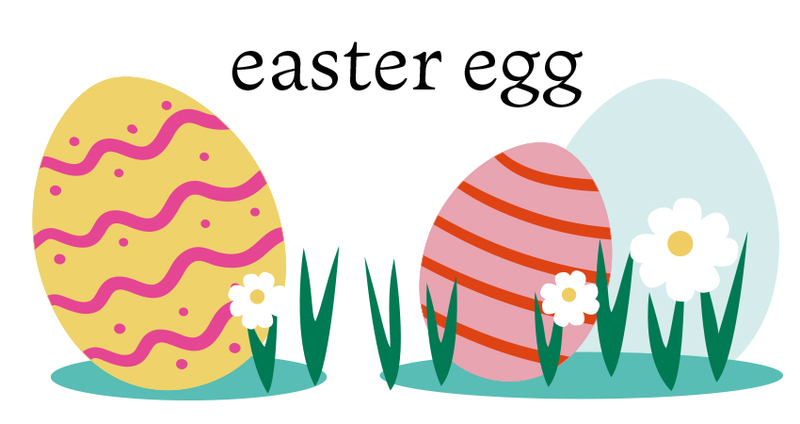 Fold each egg in half (horizontally) and staple all the eggs together through the folds that we have made. Make a hole with an awl and pass the elastic string through it so you can hang it up. And done!